Numerous fitness activities that even your reluctant students will find fun and motivating! Come dressed to participate. This will be an active seminar where you will be learning a variety of activities and games to use with your students. Join award-winning Physical Education teacher, SHAPE America Subject Matter Expert, and national presenter, Debbie Lindgren, for a NEW and innovative seminar filled with practical PE strategies perfect for all K-8 physical education teachers. 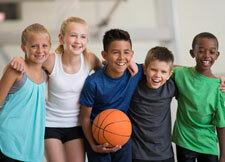 In this highly engaging seminar, you will learn a plethora of new ideas to strengthen your PE instruction, meet National Physical Education Standards and Grade-Level Outcomes, and create positive, inclusive learning opportunities for all your students – even those who have little or no confidence in their own physical abilities. You will have a chance to actively participate in a wide variety of engaging PE activities presented throughout the day. Come prepared for fun movement opportunities and a dynamic seminar! Whether you are a new or experienced PE teacher, you will walk away with exciting and engaging strategies you can immediately implement in your own PE program. You will learn many new, innovative lessons and activities to maximize your instructional time and keep your students asking for more! Focus on getting students moving to increase their activity level and motivation to participate no matter their skills … Helpful ideas for creating healthy and active PE classes … Lessons and celebrations you can use! I invite you to join me for an interactive day of new and innovative PE lessons, activities and teaching strategies that will take your PE program to the next level! Your students will thank you for showing them how much fun PE can be while learning and participating through motivating games and activities. This dynamic, engaging and highly practical seminar will provide you with leading and best practices in physical education, all aligned with the National Physical Education Standards. All the activities I will share in this seminar have been extensively and successfully used with grades K-8 students with a wide variety of skills. My goal is to give you an array of successful ideas, strategies, and activities you can use immediately in your own PE classes, regardless of space or equipment limitations! During this fun, hands-on day of learning, we will explore efficient assessment strategies to help you identify what students know and ways to empower them to succeed. We will also examine proven ways to create an inclusive learning environment where every student and teacher can be successful! It is my goal that you leave our day together motivated, empowered and equipped with a plethora of new ideas and practical strategies that will WOW your students and make your program the best it can be! P.S. As an experienced PE teacher, I know how valuable your time is. I am confident you’ll love all of the engaging lessons and innovative strategies that you’ll be able to use immediately in your own physical education program. This seminar provides a wonderful opportunity for participants to meet and share ideas with other educators interested in enhancing their PE program. Debbie Lindgren will be available at the seminar for consultation regarding your questions and the unique needs of your own physical education program.